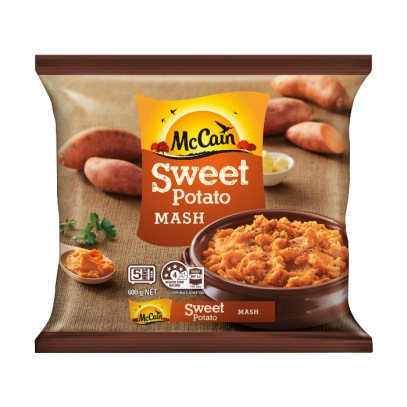 Place 250 g of frozen McCain Sweet Potato Mash into a microwave safe container. Cover and cook on HIGH for 5 minutes, stirring once half way through cooking. Remove from microwave, stir well, season to taste and serve. CAUTION: Product will be very hot. Be careful to avoid steam burns. Meal is for microwave cooking only. Microwave oven temperatures may vary. You may need to adjust heating times accordingly. For best results heat from frozen. Keep frozen at or below minus 18°C. If contents become thawed, use as soon as possible. Do not refreeze.